Do you know what your most valuable business asset is? If you think it’s your office building, million dollar secret recipes, or the inventory you have on hand, then think again. The real fuel behind a company’s growth and success comes from its people. Labor costs are often a company’s largest expense, but human capital is a critical factor in maintaining a competitive advantage. Research from The Hackett Group shows that when companies invest in talent management, they consistently outperform their peers. function with 32 percent fewer staff. Global leaders also use analytics to derive superior business insights from employee data. The best HR software can provide this type of comprehensive picture. For leading companies, effective talent management isn’t an extra feature; it’s a fundamental element that’s required for the company’s long term success. If you haven’t yet made your workforce a top business priority, follow the best practices listed below to gain some ground on the world’s best businesses, and put some distance between your enterprise and your competitors. Without a clear understanding of work expectations, employees will flounder. Each team member needs to know exactly what she is responsible for, the goals she is working towards, and how her success will be measured against said goals. They also need context in order to understand where they fit into the company and how they contribute to its overall success. To do this, start by making sure your entire workforce understands and agrees with the company’s main business goals. Tying manager, team, and individual goals to the company’s mission helps create context for projects and tasks at the department level, which gives your employees a better context for their contributions. Remember, business priorities can change fast. If a goal you set in quarter one is no longer relevant, you don’t want employees to focus on it come quarter three. Review goals frequently to ensure they reflect the company’s current priorities. Regular performance appraisals provide a chance to review past achievements, current challenges, ongoing goals, and skill development. They also open a dialogue to discuss skillsets, career aspirations, and development plans that address performance gaps. But feedback shouldn’t end once an annual performance appraisal is delivered. To maximize performance, managers must provide mentoring, coaching, and support on an ongoing basis. Employees need regular, quality feedback with specific details on how they can improve. Unfortunately, recent talent management research found that 64 percent of organizations consider their managers to be fair or poor at providing regular, timely, and in-the-moment feedback regarding performance. By relegating performance discussion to formal evaluations, managers fail to take quick corrective action while issues are still small. Move beyond performance appraisals to true performance management that involves a consistent support and improvement cycle. Once performance gaps are identified, employees know exactly which skills they need to develop in order to progress in their career. To help them take action and improve their performance, a strong commitment to developing new competencies in existing staff is required. To combat this, companies should consider implementing a learning management system (LMS). These programs provide interactive, on-demand content to help you groom employees and build a talent pool of high-potential workers that can fill vacant roles as they arise. Organizations that assign learning based on performance reviews see 38 percent better engagement and have 61 percent more positions with identified and willing successors. One of the largest capability gaps between world-class and typical organizations is in measurement and analytics. World-class organizations achieve higher levels of self-service and process automation by spending eight percent more on technology than typical companies. They also analyze HR data to identify supply and demand trends, assess risks, and uncover opportunities. Additionally, they are 2.4x more likely to rely on common platforms and toolsets for succession and workforce planning. Companies are leveraging human resources technology to enable consistent, company-wide talent management. The market for corporate talent management software is now over $5 billion in size, and includes web-based tools for collaboration and knowledge-sharing. From performance and learning management to employee engagement, these platforms allow employees and managers to locate content, share information, view goals, and develop skills — all while providing valuable data to help continuously improve the entire talent management lifecycle. The most effective talent management practices are directly tied to successful business outcomes. It’s time to make your workforce a top priority. 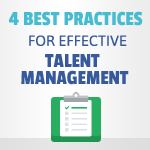 Talent management best practices can be summed up in one word: invest. Your workforce is your greatest asset. By investing in your employees’ success, you invest in the success of your organization. Jenna Puckett is an associate technology analyst at TechnologyAdvice. She covers topics related to gamification, employee performance, and other emerging tech trends. Connect with her on LinkedIn. Thanks for the article Jenna, was very insightful 😉 Agreed, employess are the heart of each organization and that’s why organization should take care of them and their developement. LMS platforms might come in handy (as you suggest) since they provide constant learning with feedback that is precious. Thanks to them employees’ improvements may be measured. Totally agree that it’s the employees that define a company and are also responsible for its success or failure. This makes the job of talent managers even more challenging. Other than the tips mentioned by you, a company needs to go the extra mile to develop a relationship with its employees. This can be done by conducting various indoor and outdoor activities that are focused on team building.